Legend has it…one day in 1946, Woody Johnson accidentally dropped a meat-filled burro into a fryer and created what is now a staple of Mexican restaurants across the southwest! 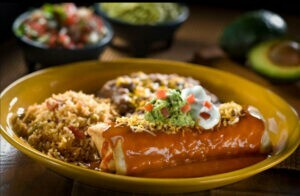 Our Macayo’s Chimi Fiesta is our annual celebration of Woody Johnson and his chimichanga creation! From February 15th to March 30th, we will be featuring our original Chimi de Macayo and a few specialty chimis; Chipotle “Bubba-Q” Chimi, Chicken Poblano Chimi and more! Join us at any Arizona location!